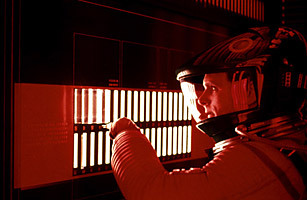 2001: A Space Odyssey doesn't involve a man-vs.-machine showdown so much as a cool, calm man-vs.-machine murder plot. HAL 9000, a spaceship supercomputer so intelligent that it even appears to have human emotions, discovers that its human companions are planning to deactivate it. So when one of the astronauts performs a spacewalk, HAL sets him adrift and cuts off his oxygen supply. The second astronaut deprograms the murderous machine, despite the computer's monotone pleas for mercy.